ReTyped for Tri-Counties by Liz DuBois . “HISTORY OF SEVEN COUNTIES presented by the Elmira Weekly Gazette". It is an “Outline History of Tioga and Bradford Counties in Pennsylvania, Chemung, Steuben, Tioga, Tompkins and Schuyler in New York by TOWNSHIPS, VILLAGES, BORO’S AND CITIES.” Written expressly for the Gazette Company, Elmira, N. Y. Copyright 1885.From AN OUTLINE HISTORY of Tioga and Bradford Counties in Pennsylvania, Chemung, Steuben, Tioga, Tompkins and Schuyler in New York by TOWNSHIPS, VILLAGES, BORO'S AND CITIES"
Chemung county, New York, was formed from the western portion of Tioga county, by an act of the legislature March 29, 1836. At that time it consisted of the townships of Big Flats, Catlin, Catharine, Cayuta, Chemung, Dix, Elmira, Erin, Southport and Veteran. In the year 1854, Schuyler county was formed, and the townships of Dix and Catharine taken from Chemung. Since that time, as will more fully appear in the histories of the townships, the remaining townships have been divided, so that the townships are now Ashland, Baldwin, Big Flats, Catlin, Chemung, Elmira, Erin, Hose Heads, Southport, Van Etten and Veteran. The county of Chemung is bounded on the north by the counties of Schuyler and Tompkins, on the east by Tioga county, N.Y., on the south by the Pennsylvania state line, and on the west by Steuben. The Chemung river enters the county from the west, in the town of Big Flats, about eight miles north of the Pennsylvania state line, and running easterly and southeasterly through Big Flats enters to town of Elmira, and passes through the center of the city of Elmira, thence southerly through the town of Southport, and along the eastern line of Ashland, enters and runs through the town of Chemung, and passes out of the county and state, into Bradford county Pennsylvania. The valley through which this river runs is one of the most fertile, productive and beautiful in the state of New York. It was originally inhabiter by Indians of the six nations, who occupied its productive lands, planted cornfields and set out orchards, erected their rude huts or habitations along the banks of the Chemung and its tributaries, spending their time in cultivating the soil, hunting and fishing, or making war upon weaker tribes, and the white men of the south and east. Settlements were made by white men in the county of Chemung soon after the close of the revolutionary war. Who the first settler was in the county is a question which has recently been discussed. Some claiming that William Wynkoop, William Buck, Daniel McDowell, Joseph Bennett, Thomas Burt, Enoch Warren and Enoch Warren, Jr., were the first settlers, and others holding to the long conceded claim that Col. John Hendy was the first white man who erected a cabin, planted and harvested a crop within the present limits of the county of Chemung. We have not the space to enter into an argument upon this subject, contenting ourselves with the reflection that a few brief months of priority in the settlement of the county will not add to or detract from the courage, hardihood, enterprise and manly spirit of the early pioneer. It was a daring and heroic act, to enter the territory at the time that either Col. John Hendy or Mr. Wynkoop and his associates did, so soon after the destructive raid and incursion of Gen. Sullivan and his army in 1779, and so soon after the treaty of peace in the year 1783, between the American Colonies and Great Britain, and while the rival claims of the Indians, the states of Massachusetts and New York were yet pending, covering a territory immediately upon the western limits of the county, and particularly so, when it will be recollected that the valley of the Chemung leading into the valley of the Wyoming was the gateway or pass, that for years had been so watchfully and zealously guarded by the Indians of the six nations. For ninety years the Penns of Pennsylvania had been gradually crowding the Indians northward, from the lower Delaware, Schuylkill and Lehigh, on to the lower Susquehanna and Juniata, and from the Juniata and lower Susquehanna to the upper waters of the latter river, the west and north branches. For forty years Northumberland, the Kingdom of Shikellemy, was guarded and watched by that Indian soveriegn; but in 1768 he retired to the Tiadaghton (Pine Creek), and in 1784 the state of Pennsylvania by treaty retired the Indians from the Tiadaghton and Tioga Point, the latter their great stronghold, and it was therefore under all the circumstances narrated, a daring and dangerous undertaking for white men to settle in the valley of the Chemung. All honor then to these early pioneers, who laid in foundation for the present happiness and prosperity of the inhabitants of Chemung county. Do not let a few months or years of priority in settlement detract from the honor and glory which should be awarded to the early settlers. The county of Chemung is unsurpassed by any inland county in the state in railroad facilities. The New York Lake Erie and Western; The Northern Central; The Lehigh Valley; The Tioga, Elmira and State Line; The Delaware Lackawanna and Western, and the Utica, Ithaca and Elmira Railroads center in Elmira, and reach out east, west, north and south through the county. Agriculture receives great care and attention from its inhabitants, wheat, corn, oats, potatoes, barley, tobacco, meat cattle, and orchard and garden products are grown in abundance. The raising of fine horses, meat cattle and sheep also is carried on profitably. The first Circuit Court held in Chemung county after its organization was held May 16, 1836. Hon. Robert Monell presiding with associates, Hon. Joseph L. Darling; Jacob Westlake and Guy Hulett. Elijah Sexton, of Veteran, was foreman of the first grand jury. The first Court of Common Pleas was held commencing July 12, 1836. Hon. Joseph L. Darling presiding. Associates, Jacob Westlake, James Hughson, Guy Hulett and Simeon L. Rood. The first proceedings in the Surrogate's Court was had June 3, 1836. Lyman Covel, Surrogate. The first board of Supervisors for the county of Chemung, convened at Spencer, in Tioga co., April 2, 1836, at the house of H. Miller. Members present, Samuel Minier, of Big Flats; Timothy Wheat, of Catlin; Jacob Swartwood of Cayuta; John G. Henry of Catharine; Green Bennitt of Dix; John W. Wisner of Elmira; Albert A. Beckwith, of Southport; Asahel Hulett of Veteran. John W. Wisner of Elmira was chosen chairman; Robert C. Hammill clerk.
. The present county jail, erected in 1872, cost $56,926.16. At a special meeting of the supervisors of the county of Chemung held Oct. 21, 1836. It was voted to direct the superintendents of the poor to purchase a farm at a cost of not exceeding $3,000. From this beginning has arisen the county poor house and farm of Chemung county. It is situated at Breesport, six miles east of the village of Horseheads. The Chemung canal and feeder was completed in 1833. The New York, Lake Erie and Western Railroad was chartered April 24, 1832. Completed to Elmira in 1848. The Elmira and Williamsport R. R. now under the management of the Northern Central R. R., completed to Elmira, in 1854. The Elmira and Jefferson R. R., now under the control of the Northern Central R. R., completed in 1849. The Lehigh Valley R. R., completed to Waverly, January 1st, 1868, and they commenced running trains over the N. Y. L. E. & W., R. R. Co.'s track to Elmira, in 1870. Utica, Ithaca and Elmira Railroad was completed in 1875. The Tioga & Elmira State Line R. R., completed and opened in Nov. 1876. Delaware, Lackawanna & Western R. R., completed in 1883. Chemung county Medical Society, organized May 3, 1836. Physicians present, Lemuel Hudson, Asa R. Howell, Nelsen D. Gardiner, John Payne, Erastus L. Hart, Nelson Winton, Thesus Brooks, Horace Seaman, H. M. Graves, W. E. Boothe, F. Demorest, Uriah Smith, Z. H. Monroe. They met at the house of E. Jones. Dr. Lemuel Hudson was chosen chairman Dr. Howell, Secretary, and a committee consisting of Doctors Paine, Hart, Demorest, Winton and Howell on constitution and By-Laws. Homeopathic Medical Society of Chemung county organized Feb. 5, 1861. Present, Drs. P. W. Gray, N. R. Seeley, T. B. Sellen, H. S. Benedict, E. H. Whippey, J. L. Corbin. Eclectic Medical Society of the Southern Tier organized July 10, 1874. Chemung County Bible Society organized in 1828. In January 1839 Simeon Benjamin was elected president. Chemung county Teachers Association organized in 1850. POST OFFICES IN CHEMUNG COUNTY. - Big Flats, Breesport, Catlin, Chemung, Chemung Centre, Elmira, East Elmira, Erin, Hendy Creek, Hicks, Horse Heads, Kendall Station, Lowman, Millport, North Chemung, Owens Mills, Park, Pine Valley, Post Creek, Pine City, South Erin, Seeley Creek, Southport, Sullivanville, Swartwood, Van Ettenville, Wellsburg, Webbs Mills, West Elmira. 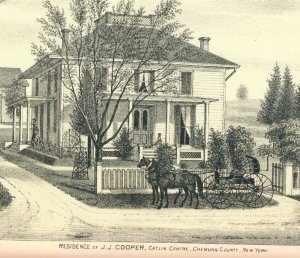 Chemung county Agricultural Society organized 1841. Re-organized 1853. ASSEMBLYMEN OF CHEMUNG COUNTY.-- 1837 Jacob Westlake; 1838 Hiram White; 1839 Jonathan P. Couch; 1840 Guy Hulett; 1841 Jefferson B. Clark; 1842-3 Samuel G. Hathaway, Jr; 1844 S. Hazen; 1845 Peter McKey; 1846 Abraham Primmer; 1847 William Maxwell; 1848 Geo. W. Buck; 1849 Alva Nash; 1850 Philo Jones; 1851 Samuel Minier; 1852 James B. Van Etten; 1853 Hiram W. Jackson; 1854 John M. Randal; 1855 Orrin Robinson; 1856 Jefferson B. Clark; 1857 William T. Hastings; 1858 John Haggerty; 1859 Peter Wintermute; 1860-61 Lucius Robinson; 1862 Tracy Beadle; 1863 Charles Hulett; 1864-5 William T. Post; 1866 Henry C. Hoffman; 1867 George W. Buck; 1868 Edmund Miller; 1869-70 Edward S. Patrick; 1871-72 David B. Hill; 1873 Seymore Dexter; 1874 Edmund Miller; 1875 Jeremiah McGuire; 1876 Edmund Miller; 1877 Hosea Rockwell; 1878 George M. Beard; 1879 John Banfield; 1880 Henry C. Hoffman; 1881 Henry C. Hoffman; 1882 Orville P. Dimon; 1883 Jeremiah J. O'Connor; 1884-5 Jonas S. Van Duzer. JUDICIARY - SUPREME COURT.-- 1847-59 Hiram Gray, Justice of the 6th., Judicial district, comprising the counties of Broome, Chemung, Chenango, Cortland, Delaware, Madison, Ostego, Schuyler, Tioga, Tompkins. CIRCUIT COURT.-- 1846-7 Hiram Gray, Judge. COMMISSIONER OF APPEALS. -- 1870-75 Hiram Gray. JUDICIAL--COMMON PLEAS AND GENERAL SESSION.-- 1836-43 Joseph L. Darling, first judge; 1844-46 James Dunn, first judge; 1846-47 Joseph L. Darling, first judge. Judges, 1836-40 Jacob Westlake, Guy Hulett, James Hughson, Simeon L. Rood; 1841-46 William T. Jackson, William H. Wisner, John Crawford, Eli Banks; 1846-47 George W. Miller, Samuel Boyer, J. A. McKey, J. L. Darling, Horace Ogden. COUNTY COURT.-- County Judges, 1847-50 John W. Wisner; 1850 Aaron Konkle; 1851-55 Ariel S. Thurston; 1856-59 Theodore North; 1859-60 H. Boardman Smith; 1860-64 Elijah P. Brooks; 1865-68 Gabriel L. Smith; 1869-78 Thomas S. Spaulding; 1878 Seymour Dexter, present incumbent. JUSTICES OF SESSION.-- 1850-51 Nelson Hotchkiss, Patrick Quinn, Almon Beecher; 1852-3 Guy Purdy, Minor T. Broderick; 1854 John N. Beers, Nelson Colegrove; 1855 Alanson Owen, Peter Blauvelt; 1856 Robert Cassady, Jason P. Woolever, Charles Patchen; 1858 Noble Weller; 1859 Robert Cassady; 1860 John Swartwood, Hiram Roushy; 1861 O. H. Lewis, Walker V. Personius; 1862 M. A. Burt; 1862-63 John C. Hathorn; 1863 J. A. McKey; 1864 Andrew Gere, Noble Weller; 1865 Jesse Rosencrans, John A. McKey; 1866 John S. Gunterman, Noble Weller; 1867 John A. Carey; 1867-69 Moses Cole; 1868 A. A. Harrington; 1869 S. A. Palmer; 1870 John L. Sexton; 1870-71 John A. Carey; 1871 James C Swartwood; 1872 John L. Sexton, Henry H. Worden; 1873-4 Elisha H. Knapp; 1874 John L. Sexton; 1875 James H. Price, John A. Carey; 1876-7 C. L. Tenbrook, Elijah Rugar; 1878-79 Charles Evans, John W. Dilmore; 1880 Samuel M. Carr; 1881 John Miller; 1882-3 Lorin Grace; 1884 James C. Swartwood. SURROGATES.--1836-40 Lyman Covell; 1840-42 James Dunn; 1844-46 B. B. Paine. At the latter date the duties of the office were assigned to the county judge. DISTRICT ATTORNEYS.--1836-41 Andrew K. Gregg; 1841 Hiram Gray; 1841-44 D. C. Woodcock; 1844 William North; 1845-47 Elijah P. Brooks; 1848-50 Erastus P. Hart; 1851-55 Edward Quinn; 1856 Archie Robertson; 1857-59 S. B. Tomlinson; 1860-65 John Murdock; 1866-68 Arastus F. Babcock; 1868 John T. Davidson; 1869-71 Robert Stevens; 1872-74 Walter L. Dailey; 1875-77 Sylvester S. Taylor; 1878 Archie Robertson; 1879 J. Sloat Fassett; 1880 John B. Stanchfield present incumbent. SHERIFFS.--1836-37 John Jackson; 1837-40 Albert A. Beckwith; 1841-43 Samuel Minier; 1844-46 William R. Judson; 1847-49 William Shellenger; 1850-52 William Thompson Reeder; 1853- 55 Daniel F. Pickering; 1856-8 William M. Gregg; 1859-61 Henry Baker; 1862-64 William Halliday; 1865-67 Edwin M. Howell; 1868-70 Jud Smith; 1871-73 George O'Hanlon; 1874-76 Allen Cooper; 1877-79 Edmund O. Beers; 1880-82 Levi D. Little; 1883 Geo. E. Stanley, present incumbent. COUNTY CLERKS.--1836-8 Thomas Maxwell; 1838-40 Isaac Baldwin; 1841-6 Simeon L. Rood; 1847-9 Green M. Tuthill; 1850-5 A. F. Babcock; 1856-8 Richard Baker; 1859-61 U. S. Lowe; 1862-4 S. B. Tomlinson; 1865-7 George Bennitt; 1868-70 Robert T. Stewart; 1871-6 John G. Copley; 1877 C. Hamilton Baker; 1878 Alexander C. Eustace; 1878 Theodore F. Smith; 1881-3 Alexander C. Eustace; 1884 Archie E. Baxter, present incumbent. COUNTY TREASURERS.--1836-43 Thomas Maxwell; 1843-6 Lyman Covell; 1847-8 E. B. Carpenter; 1849-51 Riggs Watrous; 1852-4 Nelson W. Gardiner; 1855-7 John N. Elmore; 1858-60 Stephen McDonald; 1861-3 William T. Post; 1864 James H. Loring; 1865-7 Elish H. Cook; 1967-79 Jesse L. Cooley; 1880-2 William H. Loring; 1883 J. L. McDowell, present incumbent. SCHOOL COMMISSIONERS.--1842-5 Nathan Tidd; 1846 Alonzo I. Wynkoop. At this time the office was abolished but revived again under a general law in 1856. 1856-9 Philo B. Dailey; 1859 Thomas K. Beecher; 1860-2 James McMillan; 1862 Isaac S. Marshall; 1863 Jesse McKinney; 1864-6 Isaac S. Marshall; 1867-9 John G. Copley; 1870-2 Charles K. Hetfield; 1873-5 Jonas S. Van Duzer; 1876-8 Robert P. Bush; 1879-81 Jonas Van Duzer; 1882-4 Chas. K. Hetfield; 1885 Arthur P. Nichols, present incumbent. SUPERINTENDENTS OF THE POOR.--1836-40 Wyatt Carr; 1836-38 James Van Etten; 1836-39 George Coryell; 1838-41 John A. McKey; 1839-40 William Van Duser; 1840-41 Lyman Covell; 1841-42 Jonathan P. Couch; Abram Stricker, Joel Heller; 1842-44 Timothy S. Satterlee; 1842-46 Horton Huston; 1843-6 F. Hager; 1844-6 E. B. Carpenter; 1846-8 D. W. Frost, Silas Breese; 1846-8 Hiram White; 1847-8 W. W. Bennett; 1847-9 David A. Degroff; 1849-50 Joseph L. Darling; 1849-51 John M. Robinson; 1850 Hiram W. Atkins; 1851 James M. Van Duzer; 1852-54 Guy C. Hinman; 1855-7 C. C. Humphrey; 1858-60 Jesse Barnes; 1859-74 Joseph Rodburn; 1875-76 John M. Griffin; 1877 John P. Breese; 1878 Alfred Strader; 1880 A. Strader; 1882-3 Elliott Griggs; 1884 Eugene Atkins, present incumbent. COMMISSIONERS OF LOANS, U. S. DEPOSIT FUNDS.--1843 Thomas Maxwell; 1852 E. Jones, George V. Hitchcock; 1854 Jason P. Woolever; 1855 S. B. Tomlinson, Abram Minier; 1857 Frank Collingwood; 1859-69 D. W. C.
Curtis, Alonzo I. Wynkoop; 1870-2 Jason P. Woolever, William Sharp; 1873-4 G. Smith Carman; 1873-8 Paul Collson; 1880 Paul Colleon, W. R. Hammond; 1883-4 Paul Collson, Nathaniel Owen. COMMISSIONERS OF EXCISE.--1857-8 Lyman Covell; 1857-60 James M. Van Duzer; 1857-62 George W. Buck; 1859-65 Henry Thompson; 1861-6 Myron Humphrey; 1862-8 Lyman Covell; 1862-6 John Ross; 1864-71 Stephen T. Owen; 1866-71 Luther Caldwell; 1868-71 Harry J. Bentley. CHAIRMEN OF THE BOARD OF SUPERVISORS.--1836-7 John W. Wisner; 1838 John G. McDowell; 1839 Philo Jones; 1840 John G. McDowell; 1841-2 Alonzo I. Wynkoop; 1843 Thomas S. Andres; 1844-6 John W. Wisner; 1847 George W. Buck; 1848-50 William R. Judson; 1851 George W. Buck; 1852-4 John N. Beers; 1855 James Griswold; 1856 Samuel H. Maxwell; 1857-8 Jason P. Woolever; 1859-60 Samuel G. Hathaway, Jr; 1861-3 George W. Buck; 1864 Robert C. Wilson; 1865 Israel McDonald; 1866 Edmund Miller; 1867 Geo. W. Buck; 1868-71 Edmund Miller; 1872-3 Thomas Cuddeback; 1874 Jud Smith; 1875 Dennis H. Sweet; 1876-7 O. P. Dimon; 1878 John Brown; 1879-80 O. P. Dimon; 1881 Dennis H. Sweet; 1882 George S. McCann; 1883 Alexander H. Parke; 1884 Miles T. Cassada. CLERKS OF THE BOARD OF SUPERVISORS.--1836 Robert C. Hammill; 1837-42 Philander Norton; 1843-6 Albert F. Babcock; 1847 Charles G. Fairman; 1848-9 Albert F. Babcock; 1850-4 J. B. Moore; 1855 Lathrop Baldwin, Jr; 1856 J. B. Moore; 1857-64 Lesse L. Cooley; 1865 R. R. R. Dumars; 1866 Jesse L. Cooley; 1867 Samuel C. Taber; 1868 Jesse L. Colley; 1869-74 Royal R. Soper; 1857-8 Hiram B. Berry; 1879-84 F. A. Stowell. MEMBERS OF CONGRESS.--1837-9 Hiram Gray; 1841-3 Samuel Partridge; 1849-51 William T. Jackson; 1871-3-7 H. Boardman Smith; 1833-7 John Arnot, Jr.
PRESIDENTAL ELECTORS.--1852 John G. McDowell; 1868 William R. Judson. GOVERNOR.--Lucius Robinson 1877-9; David B. Hill 1885. LIEUTENANT GOVERNOR.--David B. Hill 1883-4. COMPTROLLER.--Lucius Robinson 1862. CANAL COMMISSIONER.--Charles Cook 1848. CANAL APPRAISER.--Elijah P. Brooks 1865. STATE ASSESSOR.--Ariel S. Thurston 1859-62. DELEGATES TO CONSTITUTIONAL CONVENTION.--William Maxwell 1846; Tracey Beadle, Elijah P. Brooks, 1867. MEMBER TO CONSTITUTIONAL COMMISSION.--Lucius Robinson 1872. SECRETARY OF CONSTITUTIONAL CONVENTION.--1867 Luther Caldwell. STATE SENATORS.--1840-3 Andrew B. Dickinson; 1850-1 George B. Guinnip; 1858=9 Alexander S. Diven; 1867-9 John I. Nicks; 1883-83 J. Sloat Fassett.